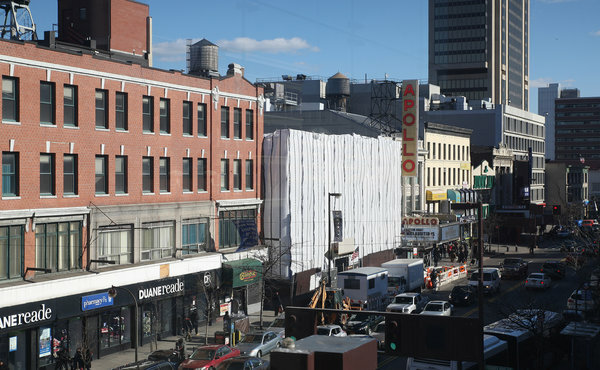 Developers are building a $14 million retail building next to the Apollo Theater on 125th Street that will expand dining choices. The recession slowed commercial real estate development everywhere, but it was particularly hard on Harlem, which had only recently begun to attract national retailers after decades of disinvestment. A number of projects had to be shelved when the financial markets dried up. Financing is still hard to come by in Harlem, but these days, 125th Street, the neighborhood’s main shopping street, is beginning to hum with activity. Two new developments are currently under construction, each featuring the kind of chain restaurant that was rare in the neighborhood not so long ago. A third project that will bring Upper Manhattan its first Whole Foods supermarket is also expected to get started later this year. Anchored by a 30,000-square-foot Designer Shoe Warehouse, the new development at 301 West 125th Street is directly opposite Harlem U.S.A., the pioneering retail and entertainment center that opened in 2000, giving the neighborhood its first movie theater in many years — now called the AMC Magic Johnson Theater Harlem 9 — as well as national retailers like a 35,000-square-foot Old Navy store. Half a block to the east, the developers of Harlem U.S.A., Grid Properties and the Gotham Organization, are putting up a $14 million, three-story retail building at 269 West 125th Street, next to the Apollo Theater, which will include a Red Lobster restaurant, also new to the neighborhood. In the early days of Harlem U.S.A.’s existence, shoppers and moviegoers had few places to eat within easy reach, but first local restaurants and then chain restaurants have provided more choices, said Grid’s president, Drew Greenwald. He said he expected to lease the shopping mall’s only current vacancy — an 11,000-square-foot space that was previously occupied by a bookstore and the Hip-Hop Culture Center — to a casual sit-down restaurant whose name he was not ready to disclose. “This corner is becoming a little bit of a food hub,” he said in an interview in his office at Harlem U.S.A. The two new developments have more in common than seafood, however. Both are being financed by their developers. “The capital markets are still circumspect across the board, and in Harlem, where things are almost always more difficult, that’s true as well,” said Kenneth J. Knuckles, chief executive of the Upper Manhattan Empowerment Zone, an economic development program. Financing is also not expected to be a problem for a development intended for a large, weedy lot at the southwest corner of Lenox Avenue and 125th Street. The site was acquired several years ago by the retail specialist Jeff Sutton, who is planning a five-story glassy building that will include two creditworthy tenants: a 40,000-square-foot Whole Foods supermarket and a 75,000-square-foot Burlington Coat Factory. The site is opposite the Harlem Center, whose tenants include Marshall’s, Staples and other national retailers. But the Whole Foods lease came as a surprise to many people in Harlem. “It was a shock, because of the price point,” said Barbara Askins, president of the 125th Street Business Improvement District. In 2010, one-quarter of the families in Central Harlem had incomes below the poverty level. But the neighborhood has been attracting more affluent residents, and many of them go out of their way to shop at Whole Foods, Ms. Askins said. And then there is the foot traffic: some 900,000 people walk along 125th Street each month, she said. Developers of other projects on 125th Street, however, have yet to pin down the financing they need to begin construction. Janus Partners, a company with a long track record in Harlem, and Monadnock Construction hope to start work this year on the redevelopment of the long-dormant Taystee Bakery complex. They were awarded development rights in 2011 after a previous plan involving the food market Citarella did not work out. The site was rezoned in November to permit a mixture of uses. Jerry Salama, a principal at Janus, said the $100 million, 330,000-square-foot project, called Create@Harlem Green, hopes to attract the type of nonprofit, technology and creative industries that have been flocking to Midtown South, the office district between 42nd Street and Canal Street, in recent years. “Lots of leases are expiring in Midtown South, where rents have doubled since tenants first signed leases,” he said. “We want to be the alternative that is affordable.” Prospective tenants include the Harlem Brewery Company, which would move production there from Brewster, N.Y.; a biotechnology firm; some nonprofits — and, appropriately enough, a bakery. The site is close to where Columbia University is building its new Manhattanville campus. “The proximity to the Columbia expansion makes this project more feasible and exciting,” said Blondel Pinnock, a senior vice president at the Harlem-based Carver Federal Savings Bank and the chairwoman of the 125th Street Business Improvement District. Danforth Development Partners and Exact Capital say they also plan to break ground this year on the redevelopment of the Victoria Theater, a long-closed former vaudeville house just east of the Apollo Theater. Like several other projects in Harlem that have yet to materialize, the Victoria complex, which has been in the works since 2007, is challenging. It would include 229 rental apartments, half of them income-restricted; a 210-room Cambria Suites hotel with a ballroom; retail stores; and a cultural arts center with two theaters. Zoning regulations encourage developers to include cultural uses to give the street more character and prevent it from turning into a big-box strip. Craig Livingston, a managing partner of Exact Capital, which joined the project in 2011, said lenders had been wary of committing to a new hotel in what was considered an untested market. The Cambria Suites would be only the second hotel built in Harlem since 1913, when the Hotel Teresa opened. The other new hotel is a 124-room Aloft, which lacks a restaurant and other amenities. “You can’t point to 20 other successful hotels in Harlem, but the economics are there to support a new hotel in Harlem — definitely,” Mr. Livingston said. He cited the popularity of 125th Street as a tourist destination and the pricing advantages of being outside Midtown. An article in the Square Feet pages on Wednesday about new commercial development in Harlem misstated the relationship between Aurora Capital Associates and the Adjmi family in a project on 125th Street and Frederick Douglass Boulevard. They are equal partners. Aurora is not the minority partner. A version of this article appeared in print on February 6, 2013, on page B10 of the New York edition with the headline: Harlem’s 125th Street Attracts Big Retailers.